Decorative organization that's fun and practical. Your house is a busy place! Between homework, birthday parties, and work functions, you can amass quite the collections of papers and cards. What better way to stay on top of everything than a set of refrigerator magnets? Our magnets are both stylish and functional, providing you an easy way to hang everything from artwork to appointment reminders. Punch up your home décor with 36 heavy duty magnets and the strong metal clothesline. Hang it up in the living room to add an industrial chic feel to the home, or use it in the mudroom to keep track of homework and after-school activities. Display pictures and drawings for a unique decor element, or you can use it for practical purposes. Either way, you can both our cylinder and clothespin magnets work wonders with it! While we're sure that you'll find hundreds of uses for your magnet set at home, it can also be a great gift for a teacher or other creative professionals! The metal clothesline is the perfect accessory for the classroom, allowing teachers to display projects and announcements. And the students will love looking at the pig, dog, cat, sheep, cow, and bee that are artfully designed on the wooden magnetic clothespins. We know that you're going to love our refrigerator magnets just as much as we do! After all, they're the perfect accessories for your busy home and hectic office. But we don't ever want you to feel like you're stuck with a product that doesn't work for you. If you find that our magnets aren't what you were looking for, you can send them back for a full refund. Don't miss out on this attractive deal! Add one to your cart TODAY! 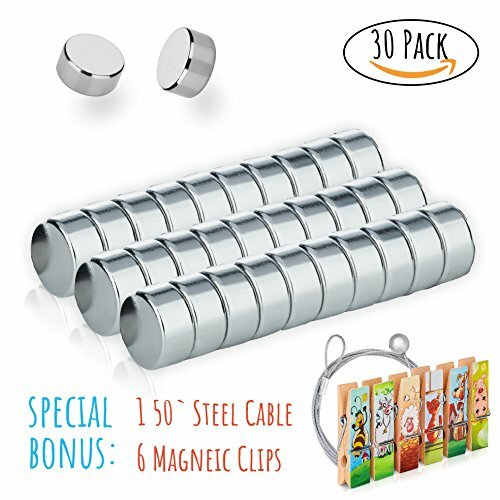 DURABLE & SUPER STRONG - This unique set includes 30 - 6MMX3MM stainless steel thin craft magnets that are 10x stronger than regular disc magnets, One little magnet can hold up to 10 A4 papers. 3 LEVELS ABOVE ALL - Don`t risk buying a cheap product. None of the other sets has the quality, strength and the diversity of our heavy duty set. Just take a look at what you get and compare. THE EXTRA`S - In addition to the 30 cylinder circle magnets you also get 6 adorable colored magnetic clips and a cool 50 inch metal wire that will help you display photos in a unique way. CUTE & USEFUL GIFT - Use them in your kitchen, office, whiteboard, garage, kid`s room, diy & science projects, locker, or on any home improvement task that you have. ✔ LIFETIME POWER GUARANTEE - We are so confident of the premium quality of this custom set that we are willing to refund you ANYTIME if you are not completely satisfied with your purchase. View More In Refrigerator Magnets.